Happy Old 97's day! While I don't think you'll get the day off work or anything, September 7th (9/7, ah yes, now it makes sense) is as good a day as any to listen to the Texan alt-country rockers. If you're aren't familiar with them, here's the cliff notes. 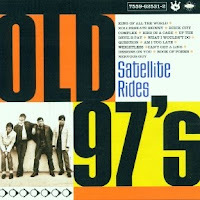 Old 97's was formed in 1993 and helped pioneer the alt-country movement of the late 1990's/early 2000's. They've released seven full length albums, a couple EPs, a live album and their next album, The Grand Theatre, Volume One, will be released this coming October. It's never too late to become a fan of a band that's still putting out good music! While their 2001 album Satellite Rides gets some criticism as being too polished and produced compared to their earlier albums, I have no problems with it. Rhett Miller's voice is as moving as ever and their rootsy influences still show up on every song. "Questions" is probably my favorite track off the album. Eventhough it's just Rhett's voice and acoustic, you really don't need any thing else with songwriting this pure and good.